I would think that his employer would take him to the woodshed, but it’s CBS so he is probably being groomed to be Stephen Colbert’s trusted sidekick. Leavitt didn’t realize the magnitude of this tragedy? 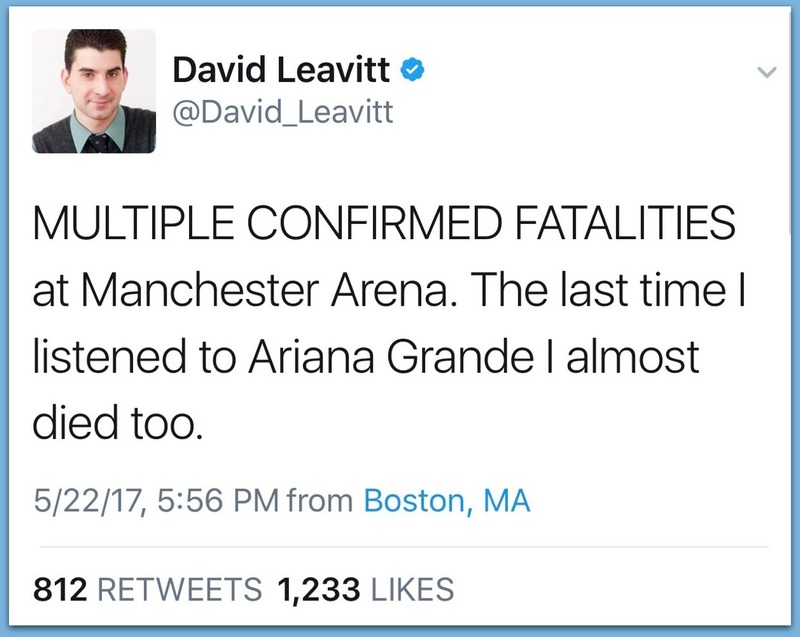 What is unclear about “multiple confirmed fatalities?” English children blown up by a terrorist is a big joke to this Leftist piece of crap. I am sick and tired of these Liberal non-apology apologies. TGP: Two explosions went off tonight at Manchester Arena where popstar, Ariana Grande was performing killing over 20 people and injuring over 50. Below is a photo of what this reporter is making fun of. There is nothing remotely funny about this. A terrorist attack that takes the lives of innocent people including women and children is absolutely devastating.